Healthy U-Akansha : Wii..IT HURTS! A healthy 14-year-old girl in the United Kingdom suffered a fracture in her right foot when she fell off a Wii Fit balance board, says a letter in the New England Journal of Medicine. Highly popular Wii interactive games allow players to participate physically in games and sporting events, and not just with their fingers or by moving their hands and arms to swing virtual sports equipment like tennis racquets. 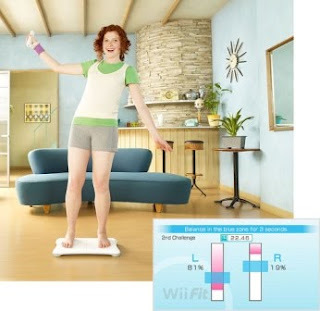 A Wii Fit balance board replaces handheld controls with a pressure-sensitive board about 2 inches off the ground that lets the user try to improve balance. The little device, which resembles a skateboard, allows players to control movements on-screen via balancing movements, twists, and turns. It’s been touted as another health-promoting Wii game that forces people off couches and into action that burns calories. But sometimes such play can cause problems, Karen Eley of Oxford Radcliffe Hospitals NHS Trust in Oxford, England, writes in a letter in the New England Journal of Medicine. “Other reported Wii-associated injuries have included traumatic hemothorax (from a fall while playing), dislocations, and head injuries (from being struck accidentally by a gaming partner).” A hemothorax is a collection of blood in the space between the chest wall and the lung. A study published in October 2009 suggested that 12% of young video game players have finger pain, enough to limit gaming time; and 10% have wrist pain. Eley, K. New England Journal of Medicine, Feb. 4, 2010; vol 362 : p 5. WebMD Health News: "Nintendo Game Sparks Acute ‘Wiiitis.'" WebMD Health News: "Video Games May Cause Kids Pain."